Below are some of the first photos taken with my ‘new’ 1950’s Super Ricohflex twin-lens reflex (TLR) camera. I’m really happy with this camera. 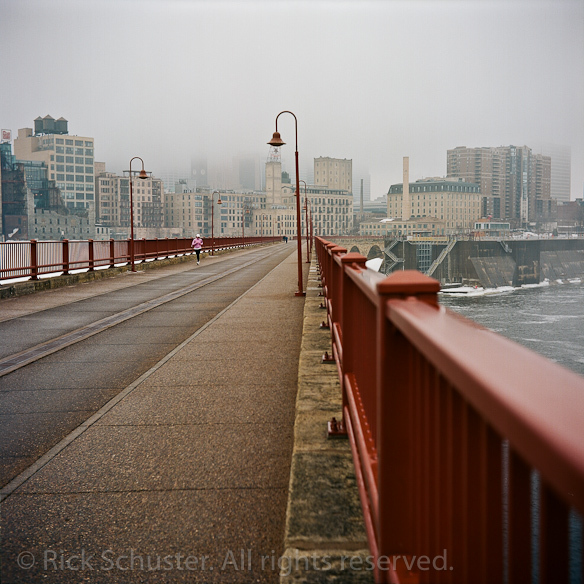 I’ve never before shot square format images, and I love composing the photos in a square. There seems to be something more powerful about square compositions. And composing images in a TLR camera is so different than any photographic experience I’ve had before. With most cameras you look through a viewfinder and see something very similar to the view with the naked eye. But with a TLR camera when you see the image reflected onto the piece of ground glass, the image seems to be simplified in a way that helps you concentrate on the basic forms and shapes in the image. It focuses my attention much more on the overall composition of the image, as opposed to the little details in the image. 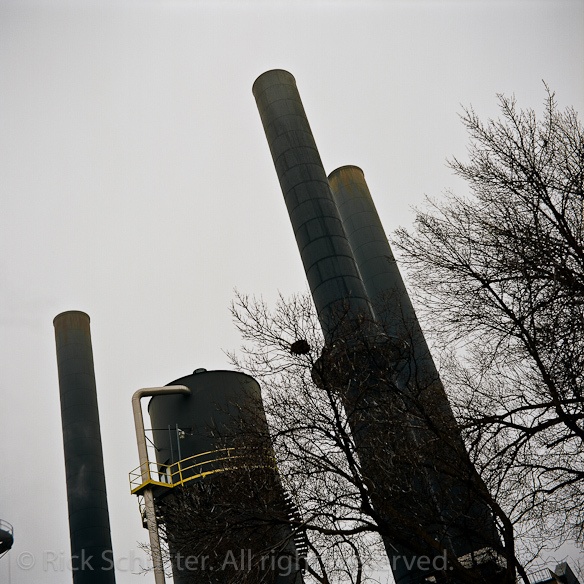 The images below are from the first two rolls of film that I shot in the camera after getting it working – one roll of Tmax 400 black and white film, and a roll of Kodak Ektar 100 color negative film. 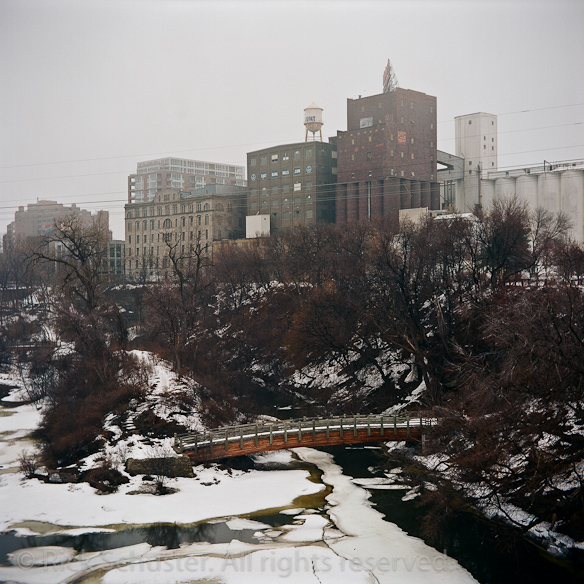 Flour mills on the other side of the river. Ektar 100, 6x6cm. Here’s the camera these were shot on. 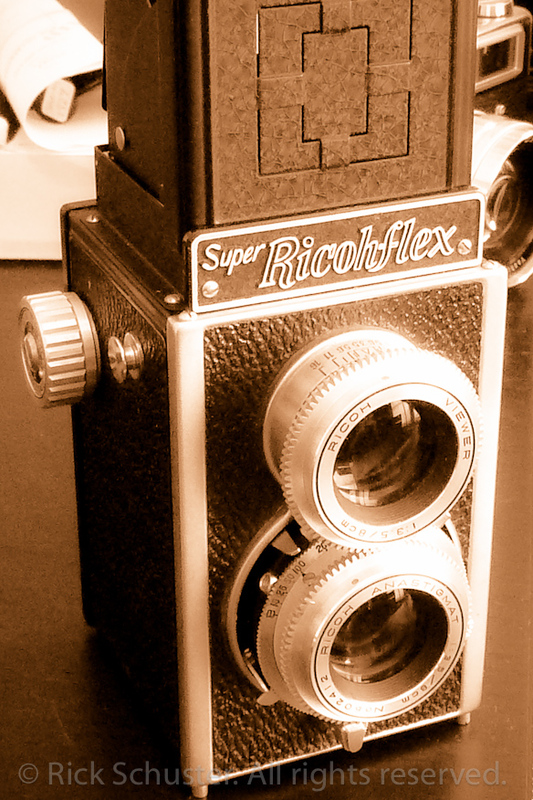 This 1950’s Super Ricohflex was my first old camera that I bought on ebay, on the recommendation of camera repairman Mark Hansen, who likes these cameras for their simplicity, ease of fixing, and decent lenses. I’ve long wanted to get a twin-lens reflex camera, and this looked like a good way to give it a try. Bought for just $36, the camera was in need of some repair, but it was a fun project to take it apart and learn exactly how this extremely simple camera operates. I’ll spare you the details about how the camera works, but I’ll say that it’s a very easy camera to take apart and fix. The front panel comes off of the camera giving you easy access to dismantle the lenses and the shutter mechanism. 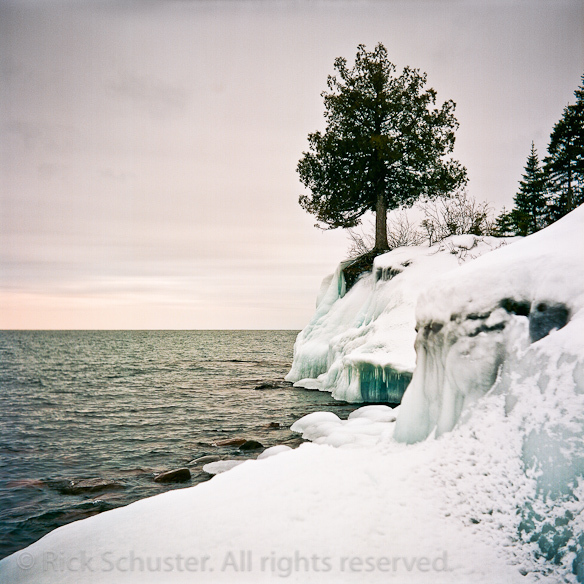 I had my film developed and scanned at North Coast Photographic Services and am pretty happy with the scan results. I did the Budget Scans, but I think I’ll give the higher-cost Enhanced Scans a try next time. These relatively low-res Budget Scans create a 4 megapixel image. The black and white scans were very high contrast with a lot of detail lost in the shadows – a little disappointing. 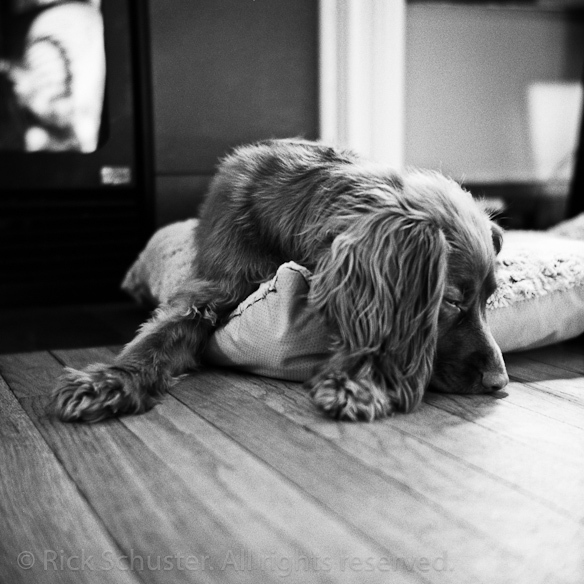 I got better black and white scans off my Epson V500 flatbed scanner (the image of Riley is from my own scan). Their color scans were better than what I could do with my own scanner, though (I’ve not spent a lot of time perfecting my scanning process, so perhaps it could improve, but I don’t really want to spend a lot of time at it). Even if they’re not perfect, the budget scans are a reasonable-priced way to get the whole roll scanned at the time of processing, then you could get better scans later of certain images. But if the Enhanced Scans are a lot better, it’ll probably be worth the extra $6 to just get the whole roll done that way to start. I’ll try it next time. I’m having a great time with this camera and I’ll share more photos taken with it in the future.